When SuperPixel, a digital products studio with offices in Galway and London, decided to offer the spare desks in its Galway office to rent, the response was phenomenal. SuperPixel Labs now runs two co-working spaces in the city centre. 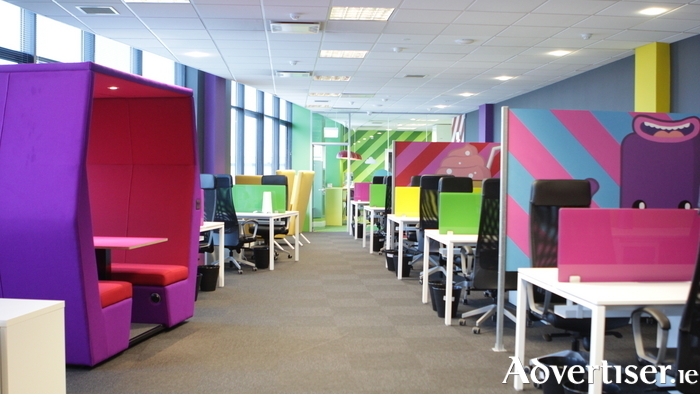 The main lab in Fairgreen has 50 desks and hosts several individuals and companies, including SuperPixel’s Galway team. The second, smaller space of 11 desks, dubbed babylabs, is in New Dock Street and is home to a community working in marketing, PR, and social media. The main space, located on the first floor of Fairgreen House, opened for business in February. This bright, colourful, ultra-modern open plan space includes a board room, a large games room which is also used for meetings and events, and a spacious kitchen. SuperPixel Labs is located close to Galway’s other co-working spaces, Band of Ireland StartLab and the Portershed development, in the city centre’s nascent innovation hub. With such a central location, it offers a great space for events, which it holds regularly, ranging from tech evenings and coding workshops to fundraising coffee mornings, to major events, including this weekend’s Galway Startup Weekend, the first startup weekend in the country to focus on food technology. Ms Dalrymple was an organiser of the first Galway Startup Weekend in November 2014, and SuperPixel Labs remains very involved in the initiative, which brings people and ideas together and leads them through the process of developing a startup, from initial team building and idea validation, through development and mentoring, to ultimately building a product. The office hosted a Women in Technology Galway meetup last evening. A MapJam event, which aims to map the city’s shared resources, will take place next Wednesday, and the space will host an evening as part of Tech Week on April 27. SuperPixel Labs is also very focused on developing a community among those who use the space, and providing workers with an environment which is conducive to collaboration and productive work. The space is a visually striking mix of clean lines and primary colours, and comes with its own bike shed for those who cycle to work. The kitchen is stocked with complimentary snacks and beverages, including gluten and dairy-free options. A number of additional perks are in the offing, including a massage service and a dinner club. There are also regular in-house information events for clients. The formula has proven extremely popular, particularly with the increasing demand for spaces which are both productive and fun. Just a few desks remain available at SuperPixel Labs, and these are not likely to be free for long. “We needed to grow. We needed the space, and there’s a demand out there for different working spaces, especially millennials, they’re looking for that Google-like space to work in, and we’re able to give it to them,” Ms Dalrymple said.